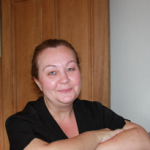 Sandra is qualified in both Alternative Therapies and Beauty Therapy. She specialises in deep tissue, hot stone and aromatherapy massage as well as reiki, reflexology & Indian head. Sandra used to be a Bank manager (what?! I hear you say) for many years and knows just too well the stresses and strains that desk work can put on the neck and shoulder area. Sandra likes to go out for meals, drinks & coffees with family & friends and enjoys walking, cycling and spending time with her two girls. This entry was posted in Who We Are on July 20, 2014 by james.